I am so exhausted right now from working the Yankee Fantasy Camp photo shoot today. I have never been called "little lady" and "cute girl" so many times in one day in my entire life. Especially on a day when I am performing in a professional capacity. Those Yankee legends must have missed the feminist movement while they were playing ball. One entertaining part of the day was seeing the "stars" get pissed off when I asked them who they were and to spell their names. "Okay, so Tommy is your first name and John is your last? Got it. Tommy John. And are you a camper or one of the coaches?" I wasn't trying to be rude. I just needed to get their names and I really couldn't tell the difference between the real Yankees and the fantasy campers. Tommy John was actually pretty nice. He started calling me "rookie" after he learned that I was shooting a live sports event for the first time. BTW, shooting a baseball game is really hard. I prefer the rock shows. Don't forget to enter the Shopgirl contest. Get your entry in by Thursday! Gilmore Images at Cafe Press! While my other site is in progress, you can buy some products with the images I've created over at Cafe Press. I'm working on getting a greater selection of items up there, but I'm slow. I'll get 'em up there eventually. When presented with an opportunity to do something that I would normally not do, I usually take it. I was faced with such an activity on Saturday night while I was in Marianna, Florida, with my mom and brother. My mom's birthday was yesterday and for her present, she wanted to go the Florida Caverns. The three of us arrived at the Best Western near the caverns at about 6pm on Saturday night. We decided to drive around the town of Marianna to see what was going on. After ruling out the local bowling alley on account of being crowded with PBA seniors, we looked for something else. We saw a large neon sign in a strip center on top of a hill and thought that might be something interesting. From far away, we couldn't tell if it was another bowling alley or maybe a pool hall. Upon closer inspection, we learned that it was a bingo hall! My brother moaned, my mom laughed and I let out a loud "cool!" I parked and went inside to find out the details while my brother repeated to my mom, "is she serious?" The nice woman at the bingo counter gave be the basics about prices and hours for the evening. I got back in the car and announced that we were definitely playing bingo. But first, we needed to eat dinner. That gave my mom and I some time to convince my brother that bingo would be fun. I don't think we ever persuaded him to that opinion, but we at least got him to agree to go to Mr. Bingo with us. We bought our cards and stamping markers, then looked for seats. The hall was quite crowded with a variety of patrons. We sat in the last three seats available together. The man seated at our table kindly removed his cane from the table top as we settled in. The three of us looked around the room trying to acclimate ourselves to this very foreign context. 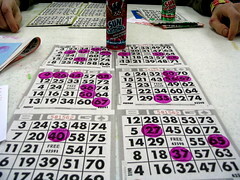 There were television monitors, boards with numbers, some kind of grid with flashing lights and official looking bingo people going to the tables collecting money. An announcer repeated "last chance to get your Treasure Hunt and U-Pick-Em cards." I had no idea what the hell was going on, but completely enjoyed every minute of it. The nice man at our table noted that we were clueless and began teaching us the ways of bingo. He explained how we had to fill out our "U-Pick-Em" cards and told us to look at the number on the back of our chairs to prepare for the prize drawing that would happen just before the game would start. As the first game started, I totally concentrated on my six cards like I was filling in the bubbles on my GRE score sheet. One card was getting a lot of action and I saw that I nearly had a vertical line. Then, "G-57" was announced. Woo hoo! Bingo! I looked to our bingo friend and asked if I just yell out "Bingo!" He looked at my card and said, "you don't have anything there. We're playin' square right now, not lines." I looked at him with a very sad and confused expression. He explained that each game was different and you hardly ever played where just one line would give you a bingo. Tricky. We played five more games with the understanding that we had to figure out what kind of game we were playing before we started dabbing our markers. My mom and I had a great time while my brother played in silence and gave us dirty looks between games. The games got more and more complicated with patterns we had to match, then they did something where the caller would announce the number drawn, plus the inverse of that number (B-14 and N-41). We didn't win any money, but were quite entertained for about an hour. I'm not quite ready to be a regular bingo player, but I'm keeping my pink stamper just in case the opportunity presents itself again. Shopgirl, the film based on Steve Martin's book of the same title, opens this Friday in Tampa. Before you head out to see it, drop me an e-mail to enter the WeirdCurves Shopgirl contest sponsored by Filter. The prize pack includes a copy of Steve Martin's Shopgirl book, a Shopgirl totebag and a Shopgirl movie poster autographed by Steve Martin, Claire Danes and Jason Schwartzman. I really wish I could enter my own contest. Entering is easy for the rest of you. Just send an e-mail to weirdcurves at gmail.com with "Shopgirl Contest" in the subject line by Thursday, November 17, 2005. I'll notify the winner by e-mail. Good luck! 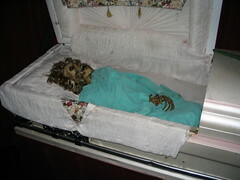 After 16 nights of staring into this casket while posing as a mannequin in "The Mortuary," I am done with my stint as an amusement park employee. With my quick pose changes and swipes at the (mostly drunk) guests, I made hundreds of people scream, jump and grab their loved ones (or the person who happened to be walking in front of them). I even made a few dozen people fall to the ground. Those were good times. It was a ridiculous way to make a buck, but I had fun. However, I certainly won't miss driving home at 2:30 in the morning or being forced to listen to drama queens squeal at each other in the break room. The next fun job I look forward to is shooting the Yankee Fantasy Camp in a couple of weeks. Let's hope I don't force anyone to ground at that gig.